The 2008 stock market crash – should we file it away as history? Even though Wall Street and the markets seem to have recovered from the 2008 stock market crash, it still matters to investors like you and me. 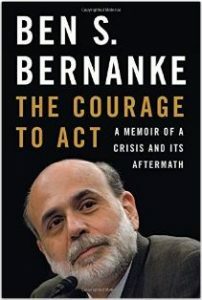 I just finished Ben Bernanke’s book, The Courage to Act: A Memoir of a Crisis and Its Aftermath. The book is well-written and explains the background of the market collapse, the crisis itself, and the aftermath. Bernanke raises a number of fundamental questions about whether we have made the requisite structural changes in our economy to avoid such catastrophes in the future. But just because Bernanke’s policies may have worked to alleviate the crisis, doesn’t mean they were the best path America could have taken. To understand why, read my complete review of the book here. Why it is so important to let individual determine how and when to spend.